"Everybody wants to be a cat, 'cause a cat's the only cat that knows where it's at." While the keepcase of this disc proclaims that this was the last animated feature that Walt Disney approved, it is also one of the least of all the animated features from that studio. Walt was in his cryogenic tank three years before this picture was released, so he can hardly have done more than approve the concept. The Aristocats continues the unhappy trend of celebrity voices begun in The Jungle Book, even though it tends to distract from the picture itself. In the case of The Aristocats, perhaps that is a good thing. The story is a weak rehash of Lady and the Tramp, with cats substituting for dogs. It is probably not a coincidence that no less than seven writers are credited with "story" but that no one was willing to take the credit or the blame. The story tells of Duchess (Eva Gabor) and her three kittens, who are pampered by their owner, Madame (Hermione Baddeley), a retired opera star in 1910 Paris. Madame changes her will to leave her vast estate to her butler, Edgar, after the death of her cats. Edgar overhears this and takes steps to make sure that there are no obstacles to his inheritance by dumping the cats out in the countryside. The lost cats meet a rough-and-tumble alley cat, Thomas O'Malley (Phil Harris, who was used to much better effect in Jungle Book) as well as two gregarious geese who help the cats make their way back to Paris to attempt to foil Edgar's plot. The film is overly long and heavily padded; an extended sequence of Edgar in the country being pursued by two dogs (voiced in inexplicable southern U.S. drawls by Pat Buttram of Green Acres and George Lindsey, Goober on The Andy Griffith Show) is essentially repeated. The lack of attention to structure betrays the many hands stirring this pot. The humor is lame and includes such chestnuts as the "walk this way" gag from the waddling geese. I found the film interminable even as a child, and it hasn't gotten any better over the years. Part of the blame rests in the lackluster score and completely forgettable tunes. Only "Scales and Arpeggios" approaches anything like the glory days of the Sherman brothers (who wrote this and two of the other songs, another odd patchwork) who did such marvelous work with Mary Poppins and several other Disney classics. Maurice Chevalier was somehow coerced into singing the bland and uninteresting title song. The 1910 setting seems pointless; nothing is made of it other than Edgar's backfiring motorcycle. Indeed, large portions of the picture are completely alien to the time period, such as the beatnik cat band and the psychedelic lighting during the big (and tedious) production number Everybody Wants to Be a Cat. From a technical standpoint, the animation style is interesting, for the line work is often feathered, giving the appearance of animated pencil lines rather than ink. While this effect is not consistent, it is undeniably intriguing and must have added to the work of the animators to a significant extent. Image Transfer Review: The image is where this disc truly shines. The Disney studio wisely did The Aristocats as an RSDL disc to maximize the video quality. As noted above, the animation line work comes through beautifully with no artifacting of any kind. Colors are bright, solid and consistent throughout. Even though the nighttime scenes in the country are very dark indeed, they are still quite clear. According to the IMDb, the original theatrical aspect ratio for this film was 1.75:1; the case says that the 1.33:1 presentation on the disc is the original aspect ratio. I am inclined to agree with the case. There are no obvious instances of panning, scanning or cropping here. There is ample room above and below the titles, however, so it is possible that the film was soft-matted in some theatres and the mattes opened up for this disc. The compositions work quite nicely in 1.33:1. Accordingly, I am not downgrading this title as a pan & scan release. Audio Transfer Review: Although the film is presented in Dolby Surround, there is precious little activity in the surrounds except for music. Dialogue is almost entirely in the center speaker. The sound mix is rather average sounding with little directionality of any kind. Sound is clear and not clipped. The different voice timbres audible on this disc are reproduced so well that it is clear that the voice actors in many instances were not recorded together. I don't recall this effect from the VHS tape, so this may be a case of the sound engineer doing too good a job of reproduction of the sound; I could have lived without this degree of accuracy. Extras Review: This disc includes four preview trailers that precede the menu. They can be passed with the chapter skip key, but the menu function is disabled. A rather dark trailer for Aristocats is also included. There is a unique extra of a storybook version of the film included. The text of the story appears on the TV screen with still pictures. You can either have the story read to you (12m:48s to do so), with music and sound effects as well as the visual equivalent of page turns, or read the story yourself and turn the page by hitting the Enter button. While this isn't quite like reading a book, it might instill the desire to read in children not interested in books. Personally, I would think this would have more value to parents if a small book were included in the keepcase. The three audio tracks (English, French and Spanish) cannot be changed on the fly, thought that is a pretty minor irritation in this film. Subtitles are only available in English. They are generally accurate, although they do not transcribe the portion of the title song that is sung in French. While the disc readout indicates there are three angles, only the one of the main feature is accessible via the remote that I could find. Comparison animation drawings would have been a nice use of these other angles. The inclusion of a $5 rebate for those who already own the VHS version is a nice touch which makes this DVD a little more affordable. 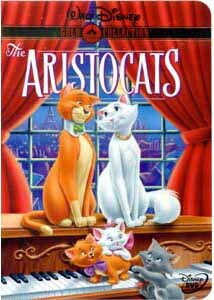 The Aristocats is one of the lesser animated features out of the Disney studio. Disney completists will want it, and will be pleased by the high quality transfer, but children and adults are likely to be bored. Go with Lady and the Tramp instead.